So you like weather, huh? “Life isn’t easy”, which is an understatement in my opinion, but we make the best of what we have. We find certain things in life that compel us to look for something more. Certain things inspire us to make actions affecting the community and world around us, no matter how so small. New things are discovered daily leading us to cures, innovations, new life stories, and give us hope for that thing we strive for. Now finding that one thing that drives us to achieve life goals alters your life. Once you know it, life seems to shift and you make that thing your priority. Mine is forecasting severe weather. As a little girl, I loved being bossy, being the leader, telling people how things should be done and why it should be my way or the highway. I loved trying to outsmart and know more than my friends at every chance available. Honestly, I remember learning about weather and different types of clouds in fifth grade and saying, “This is pointless. Why should we have to know this?” It’s amazing how that one ignorant statement, would change to such a deep passion just five years later! Oh the irony. As I mentioned before I liked to inform people, being able to explain something that was previously not understood was my joy. In 2008, Hurricane Ike made landfall on the southeastern shores of Texas, namely Houston where I have family. Remembering Katrina, I was terrified for my uncle! I watched the news anchors and meteorologists on TV for the entire event. 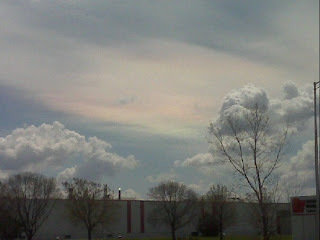 Eventually the system travelled up north to Illinois, where I live. I remember sitting on the steaming hot pavement of my grandpa’s driveway watching the storms approach. I was called inside as the adults realized the potential danger of the situation. Once I caught wits of this, I went straight to the TV, and sat for an hour listening to the meteorologist telling us this is dangerous for these areas…. 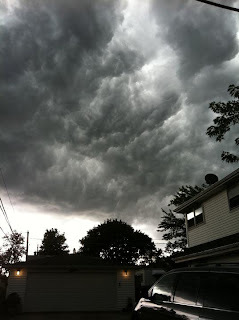 tornado watch issued for cook county… I was entranced! I ran indoors and out multiple times to watch the RADAR and the reality. My friends and I talked with such urgency that usually accompanies a 10 year old’s mind at the thought of some danger. Again I was the one who knew a bit more, and just a bit ahead of everyone else, EXCEPT the people on TV. I did not like that. As the tornado sirens went off, I took responsibility of ushering my sister to the basement since my grandpa was doubtful of nothing actually happening. My sister and I sat there for half an hour before we went back upstairs to my grandpa who was cutting apples. I heard the wind howling outside, curious I opened the door but my grandpa was outside before I could step over the threshold. I will never know exactly what he saw, but it was enough to pick up my sister and practically throw me down the stairs to the basement. 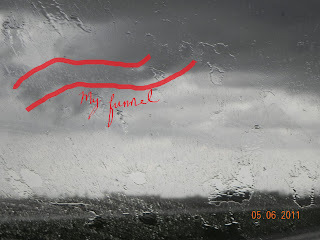 I was inches away from seeing what he claimed to be a funnel. I never saw it. The next day I bragged to all my friends of what happened and I watched their expressions as I told them my story. That was a great feeling. After a while, I dropped my interest in weather again thinking the only decent paying jobs were all broadcasting and were impossible to get. Flashing forward two miserable years to 7th grade. I was flipping TV channels until I came upon Discovery’s Stormchasers. The show was all science and every second was unpredictable. I loved it! It displayed beautiful shows of nature closely incorporated with scientists trying to crack the atmosphere, trying to figure out what seems impossible. It took me awhile to come to the realization, “Hey, these guys are getting paid. They are making a career out of this. Huh.” I think the main factor may have been that tornadoes are unpredictable; no one can tell what they are going to do. But what if I could? What if I can forecast better than these guys? What if I could make that discovery and know something no one else knows? Twenty books later, I was obsessed! Nothing but weather could hold my attention for long! I started sneaking my books into class, occasionally getting reprehended, but all worth it. All the books I could get my hands on were “basics of”. I nourished my brain with field guides rather than that new issue of teen magazine! Still it wasn’t enough. I still couldn’t forecast and barely understood why storms formed at all. I started learning the ways of the Internet and shortly discovered NOAA and took a SKYWARN session through them. 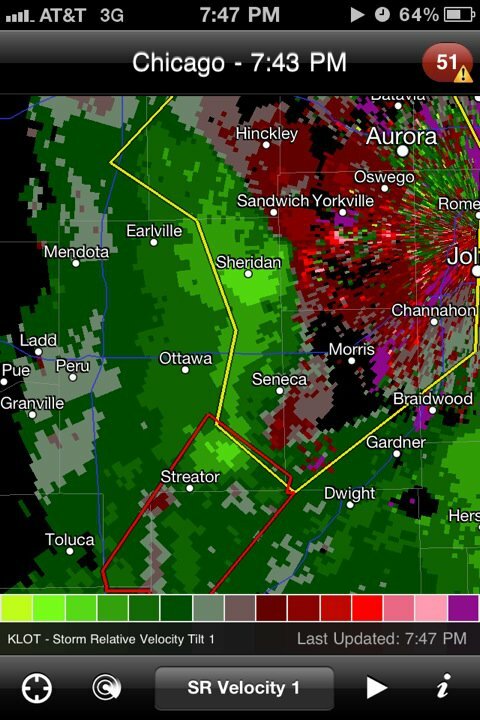 I remember meeting the Romeoville NWS head and blushing and stuttering so much. I couldn’t believe I was in the presence of someone who knew so much about what I now was. My mom sadly started to realize that this wasn’t another phase I was going through and I was legitimate about making this my career. Through girl scouts we found Eddy Weiss and Chasing4Life giving out programs on severe weather from a real storm chaser! I was so excited to finally meet someone who has been out chasing and saving lives. My first class was addicting. My mom had created a monster, and I need much much more. Through Eddy I learned the other side of severe weather, the side that left devastation and death. Suddenly my world altered once more and now I was serving two personal goals; to become an extremely accurate forecaster and save lives of people who depended on those forecasts in the process. 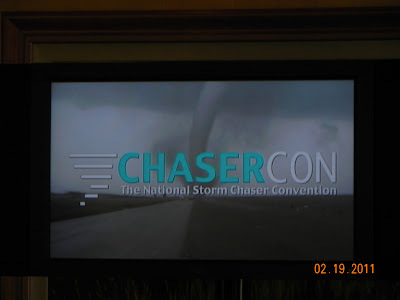 One day I stumbled upon the webpage of Chasercon, the National Storm Chaser Convention in Denver, CO. It was something I just had to attend! While other kids were having graduation parties and big fancy gifts, I only wanted this adventure. Eventually I became so annoying and persistent that my mother approved the trip. Meanwhile I went to another of Eddy’s events and mentioned my trip to him at the end. Someone finally recognized me that night and we exchanged contacts. The three days of Chasercon overwhelmed me with information beyond my comprehension! 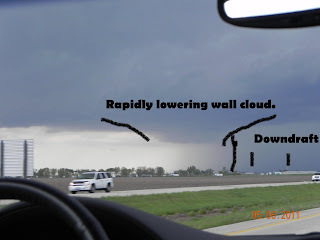 I spent a few months deciphering all the material of supercell development, forecasting, radar technologies, chasing strategies, and so much more. Forecasting was something I had to ease into. Not one prediction I made came true in my first month of attempts. 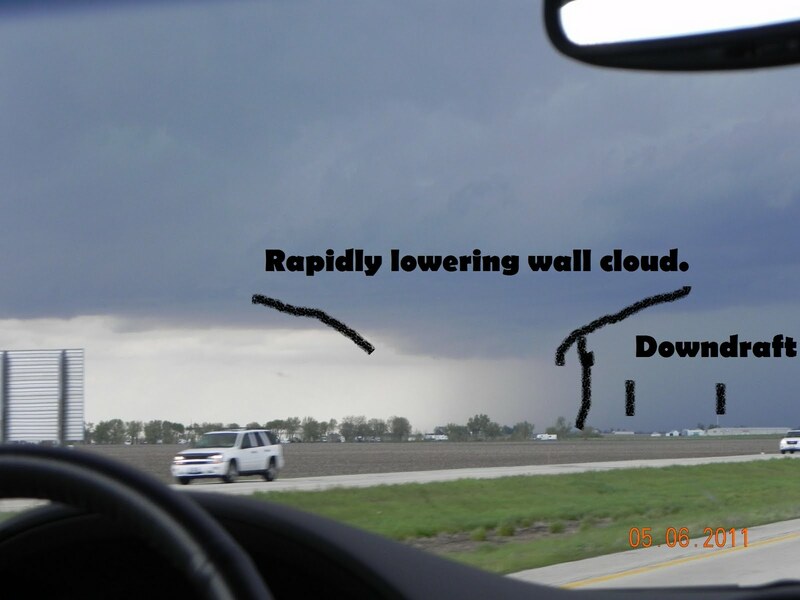 I started talking with other chasers and their strategies and what they thought of a certain upcoming storm system. I watched the models play out and started to recognize the patterns. One afternoon Eddy called me, “Jessica, I would like for you to forecast for my team tonight. We need your help since I can’t frequently check the models.” That night my forecast made the center of the Storm Prediction Center’s Moderate Risk box. I grew more accurate with every forecast after that. This itself is large and difficult journey, but add on having one parent (non-chaser), high school applications, and other kid’s cruel harassment throughout the final six months of eighth grade. I stayed true to my passion by keeping in contact with Chasing4Life and other storm chasers who encouraged me through the most difficult days of humility. Their words wouldn’t be the ones to decide whether or not I wanted a career in meteorology. Every pun and joke thrown at me was discriminating, but I found humor in it and laughed along with them. I had established that one thing in my life to strive for, why let arrogant classmates prevent further exploration? As of today I have progressed more into the field of meteorology and emergency management than I could have ever imagined. I am the Lead Severe Weather Tracker and forecaster for Chasing4Life as well as an instructor! My forecasts have been used through multiple emergency personnel many times in the 2011 season. I have had forecasts ranging 72 hours out, with tornadoes within five miles of my targeted town. 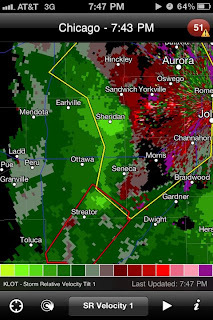 The last year has provided me with two beautiful tornadoes and many stunningly structured supercells within my vicinity. I have completed eight FEMA courses and have taken two Psychological First Aid classes through Chasing4Life. The support I have received from my family-blood related and friends- has undoubtedly lead me through the toughest challenges of my life so far, and I can not wait for the 2012 season to begin! Just thought I'd pull a thought from a recent paper I turned in. "When I look back in my life, I've discovered God mostly in nature. In the three times I have experienced tornadoes I have never felt so small and powerless to the bigger force at work. I DO NOT believe God to be the tornado (or any natural disaster for that matter) destroying property, the environment, and possibly lives. I believe that to be the earth, which produces such events to restore equilibrium, in the name of science. In all my reflections I see God in the beauty of the extremes; the complexity, the tranquility, the unpredictability (although sometimes not in my case), and through the miracles and relationships built because of the destruction it caused." 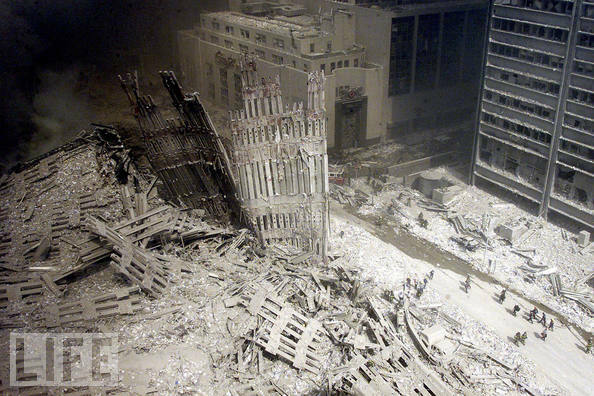 On September 11, 2001 I was only 4 years old, a preschooler who had only four hours of school. My mom had picked me up from school and seemed to be zoning out. I plopped down in the middle of the living room floor with my barbie dolls and stuffed animals I was planning to play with for the rest of the day. I remember my mom calling friends and stuttering,"Turn on, turn on the television. We've had a terrorist attack." My mom rushed to the remote, turned on the TV to see if anything else had occurred while she was gone, and as we waited for the picture on our ancient TV set, we could hear the audio of anchors babbling. As the screen came on it was of a reporter standing on the scene of the first attack. My mom was already freaking out. Of course me being only 4, I wasn't understanding what was going on. My mom's voice got urgent as she began talking and calling other family members. I just sat there continuing to play tea or whatever with my toys, occasionally looking up at the screen to see the bright colors and many upset faces. 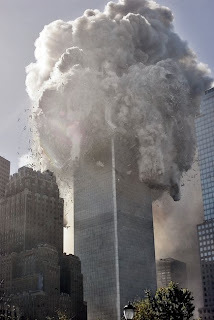 There was one reporter that particularly caught my interest, most likely because of his tone of voice and I continued to watch a repeat as the second plane rammed into the south tower. I remember thinking it was a movie trick or something. Soon after my mom recovered from her initial shock, I was told to go in my room. I don't remember much after that. Now nine years later, September 9, 2010, we spent our entire eighth grade week in Social Studies remembering everyone lost in this tragedy. 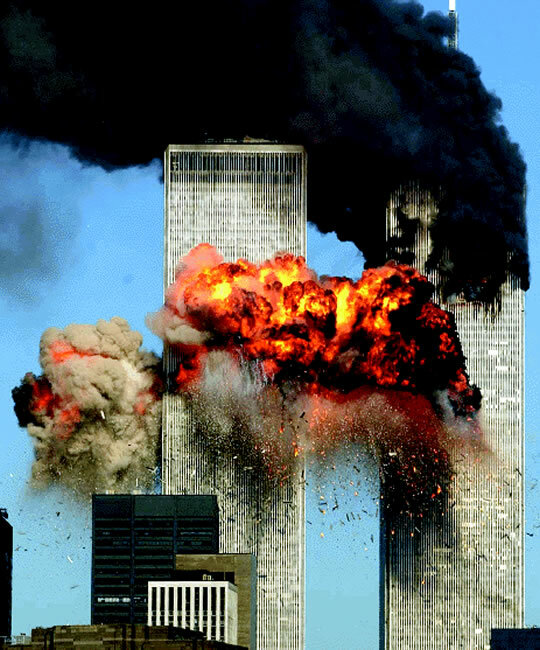 Of course we had known about the airplanes that crashed into the Twin Towers, the Pentagon, and little of the struggle of the airplane that the passengers had tried to take back control of. We watched a program that had an immediate affect on everyone. We saw the most destruction in those 40 minutes of class that had never been revealed to us before. I never knew how many people actually rushed towards the towers after it was hit. I never imagined how such a secure and sturdy building could become a trap from the deepest pits of hell. I couldn't believe that people had actually chose to jump from the highest floors of the tower to their own death, wishing to end life not by the hand of terriosts but rather themselves. All the beams and iron poles and what not sticking out from mounds of rubble. The amount of ash, debris, crumpled vehicles, bodies, and rescue members cascading the streets. We left class with tears in our eyes. Unbelievable. 9/11/11 The Tenth Anniversary now has come upon us, and as I watch TLC, the History Channel, MSNBC, and all other programs from the day America will never forget. During this year I have matured an extraordinary amount and I watch now with new eyes. I noticed all the emergency personnel, the structures, how it was hit, all the hazards, everything that could go wrong and everything that did. I paid closer attention to the expressions of those in the videos, the emotion. Through my mind I was brought to the scene. I wanted to run and help, but I was afraid that I would've been paralyzed from the intensity of it all. I wonder what I would've been able to do if I was there. I started off with the news footage from that day. I came across the reporter I had seen when I was four and broke down from the Déjà vu, but now understanding the extent of what I was really seeing. People losing their lives. I had only gotten this feeling one other time while I was tracking the cell that produced the Tuscaloosa tornado. 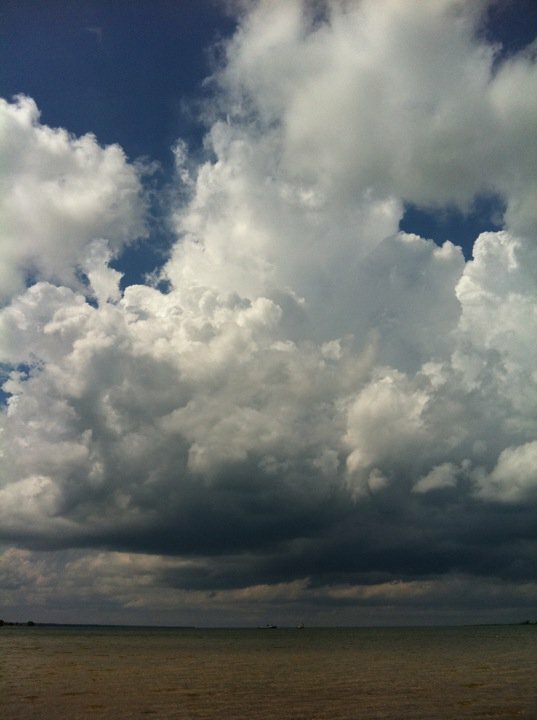 I began watching this cell as it got a hook as it crossed over from the MS border into AL. I sat there for about an hour watching as the cell produced a deadly EF-4 tornado straight into a densely populated town; Tuscaloosa. I watched it live on TV, and there is no feeling worse than that, watching peoples lives being uprooted, tossed around, and demolished in seconds. It is a moment I will never forget. 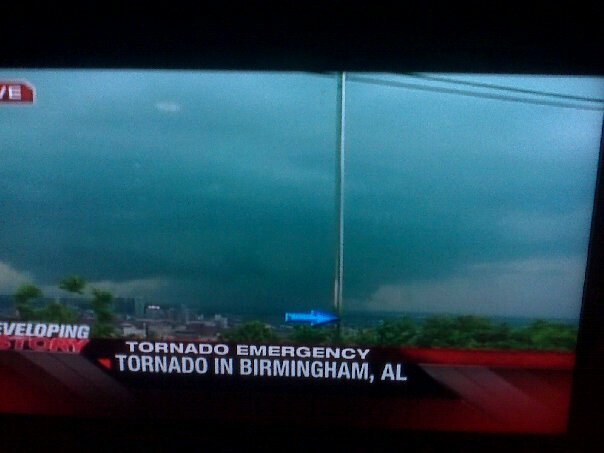 A photo of the TV from April 27, 2011 Epic Outbreak. I continue watching and looking at pictures realizing that one day, I will have to see this too. Maybe and hopefully not in the mass scale of 9/11, but I know that it is inevitable because of my career choice. 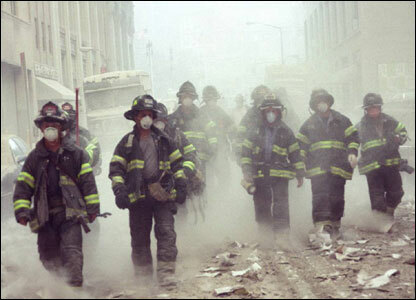 I just hope and pray that I will have the courage when the time arrives to react in such away that the rescuers, first responders, emergency personnel, and volunteers did in all of the events of 9/11. 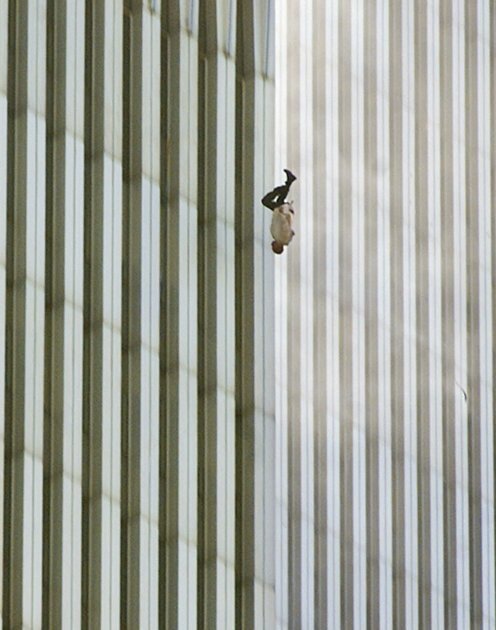 These are the photos that affected me the most. The one summer storm I happened to have my luck with was on June 20, 2011 around 8-9pm. My friend Mandy and I had just finished an out of town sporting event and starving for decent food. Naturally we chose Portillo's. I had been monitoring a line of storms for a portion of the day and watched as they ripped through the west of northeastern Illinois. 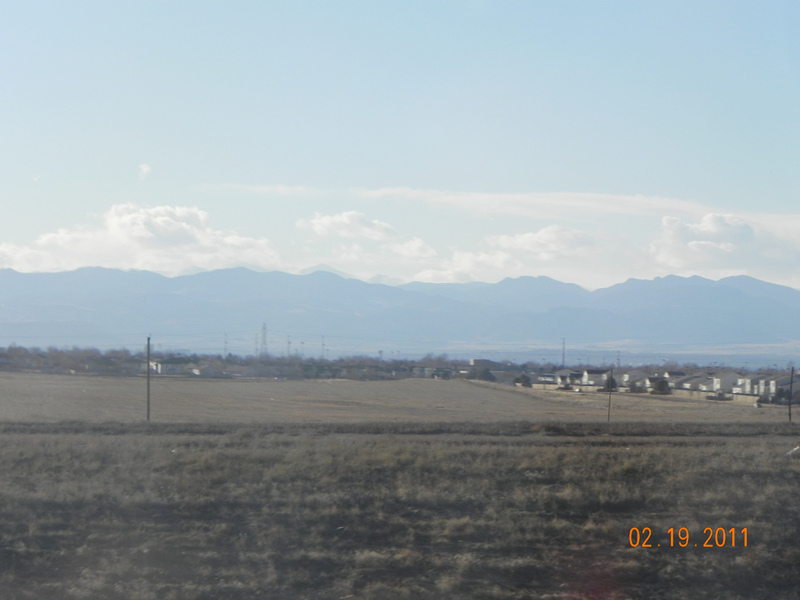 I started seeing towers pop up and began tracking them. The bands of RADAR were getting very intense with each passing frame and I showed them off to my anti-meteorology (because of my excessive weather babbling for the last two years). 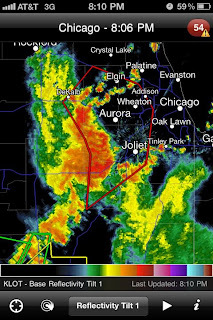 The Severe thunderstorm warning had extended across all of Cook county and into surrounding communities as well. There was no way to avoid this storm. We arrived at the restaurant around 8:15 pm, and yes you guessed it, attained a window seat! I called Eddy wondering what his opinion was of all this to find out he had already been pounded with its attributes. My friend Mandy and I got a strawberry shake to split and sat outside, soaking up the warmth and humidity. The atmosphere was prime in my words. I remember overhearing a man talking to his wife on his phone about the approaching squall line. I gave him my estimated time for its arrival and said," Take this seriously, don't ignore the warnings! Its gonna be a bad one!" Mandy added," Yeah, she knows what shes talking about. Shes my weather-nerd 411." My mom saw me pacing outside, pointing and yelling back to Mandy and took the hint it was time to get moving. The lightning grew frequent and a light rain and moved in by 8:49pm. 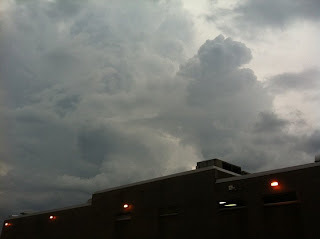 I remember looking back out the window and seeing a lowering with the approaching front of the storm. My mom locked the windows. 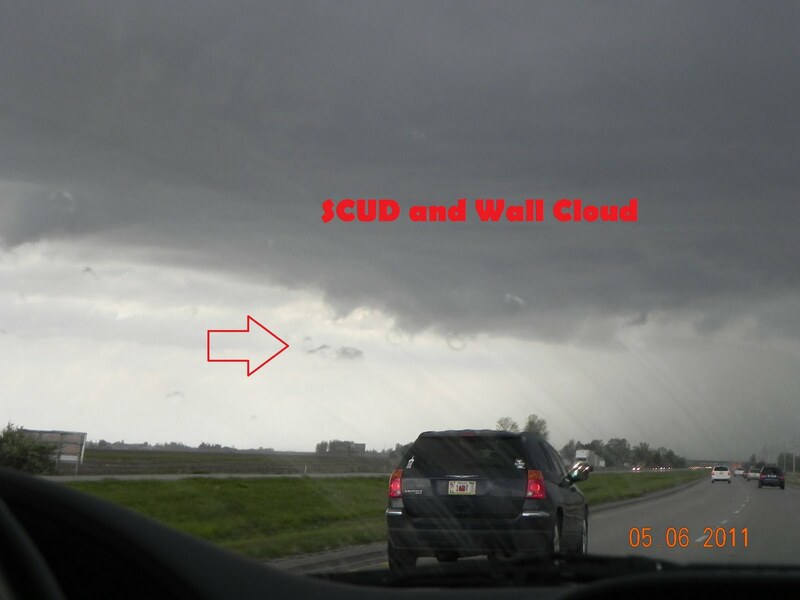 I was unable to confirm it as a wall cloud which produced a EF1 stovepipe tornado. My mom continued on with her tactic of driving forward even though I requested stopping numerous times. We were moving north through Mount Prospect, IL "out of the storms way." I hate to burst her bubble and say that the storm is a north-south line extending about 80 miles long and there was no way to avoid it. We drove for about two minutes longer until a eccentric flash of bluish-green light lit up our eyes. I shouted,"Power Surge!!! ", and that's when my mom started freaking out again. She turned up the radio to hear the announcers talk about what happened more than thirty minutes ago to our west, even though I was giving her real, accurate, and information on our exact location. Then visibility dropped drastically and we pulled into a persons driveway to avoid an accident with oncoming traffic. We rode out the viscous storm with 60-70mph and zero visibility. There was tree branches the size of cars that had fallen into the road. I called in the high winds into the Romeoville NWS. I'm not positive but there was a path of damage and at least 3 power surges around 8:59pm that could have been caused by the tornado or a micro-burst. This video does contain one swear. It was the perfect end to a long weekend at University of Illinois Champaign-Urbana. I was attending the State Science Fair Exhibition in which my project received second place. I had checked the models a few days earlier, anticipating a nice hail storm to witness at the least. I have a fairly large passion for hail and my last experience was about two years ago. I practically ran out of the ceremony when my Blackberry RADAR had updated and I saw a nice cell forming to my Northwest. It was around 3:50pm when my good friend Erica called me informing me of the same cell that had recently gone Severe Thunderstorm warned for its hail. I started paying closer attention to the towers going up, but it took another five minutes of driving to spot the upper and outer bands of my storm. I was growing with excitement by the minute! My sister began to throw a fit about her some technology function she was having, causing us to pull over and lose us precious time. Although now, I think her fit may have gifted me a tornado! Around 4:15pm we started heading west on a road I can no longer recall. That is when I caught my first look of the monsters base! 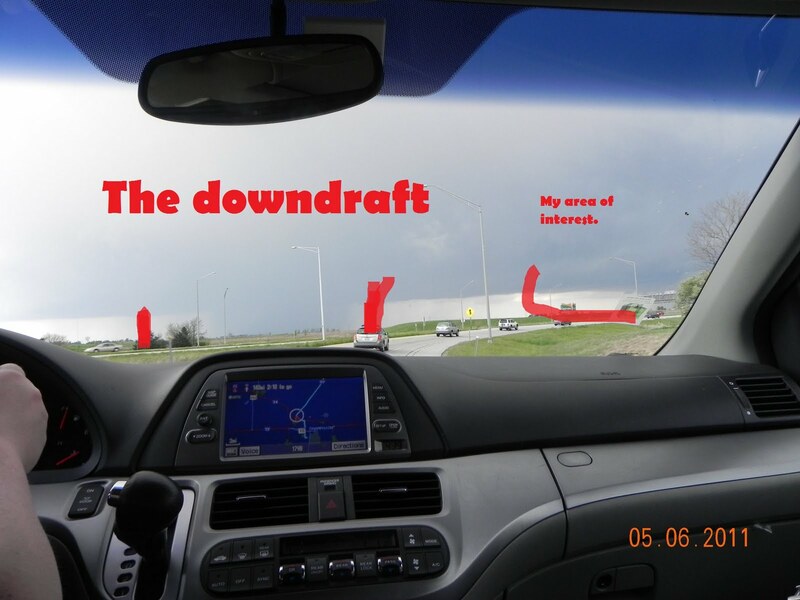 I saw two downdraft areas (rain and hail) and figured the spot where I thought there would be a lowering. At 4:20pm we turned North onto Highway 356 and I had a farther lookout on this storm. 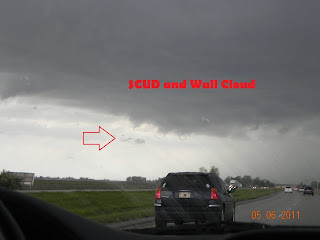 I figured that this second downdraft I had seen may have been pulled along with the storms RFD (rear flank downdraft). The area I had chosen earlier now seemed to have a slight lowering. I couldn't tell for sure because my mom, now freaking out, refused to open the windows. Thinking back on it, I only saw one stroke of lightning! Near 4:25pm I could now see a defined lowering and Erica was nowcasting me. 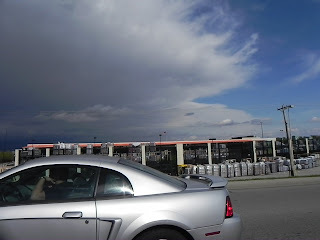 The storm was oddly enough running south easterly, parallel to the road I was traveling. My luck couldn't have been better! 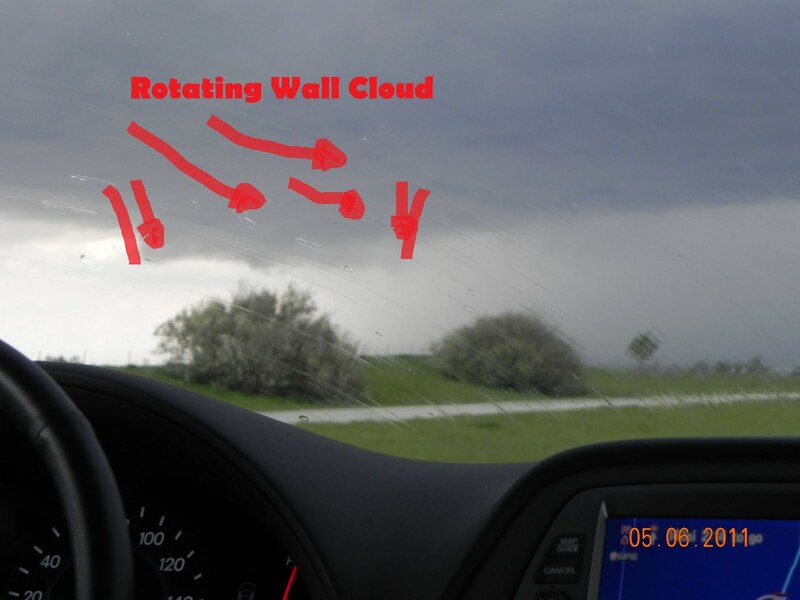 Within the following five minutes SCUD began to rotate around my lowering, which I could now classify a rotating wall cloud. I had a strong feeling that this storm could produce soon. I tried calling it in to the NWS (National Weather Service) but oddly enough, no one answered the phone. Thank god there was a SKYWARN spotter that had seen the same thing further north and was able to call it in. 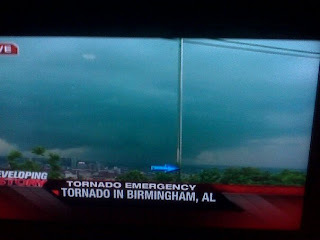 I would estimate that the wall cloud was about ten miles to my NNE when I got the news it had gone tornado warned. At 4:36pm a funnel started to descend horizontally from the wall cloud and that's when I started filming. It took my breath away and I could not shut up. My mom was no longer able to take anything I said into account and started spazzing out. This was probably triggered when I told Erica,"This thing is really wrapping up. It looks to be...an elephant trunk tornado!" Within the next few minutes, you can hear the havoc in the car when I was leaning across the seat, because my sister was unwilling to trade position in fear of not being able to watch her movie. You know when out of nowhere your seat belt suddenly chooses to strangle you and the only thing you can do is rebuckle it? While I had the unfortunate luck of that happening and my mom concerned for my safety would not stop screaming at me although I had buckled up long before she stopped yelling. My mom had refused to pull over from the beginning, leaving me without the crucial knowledge of of which direction this rapidly descending funnel was moving in. According to my mom moving north as fast as the speed limit allows of a south easterly moving storm would lead us out of danger. That would've worked (and thank God it did) if we weren't south of this storm. 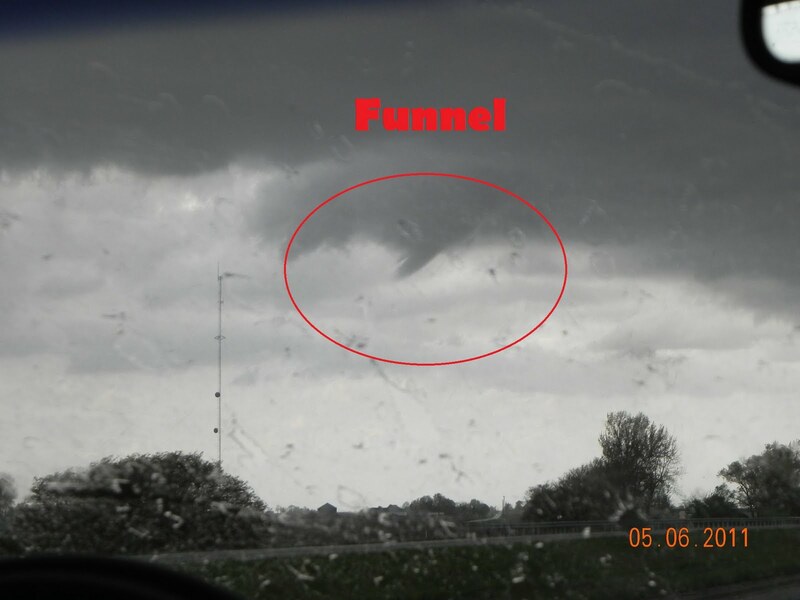 I then started to grow concerned realizing we were about 2 miles from the funnel that could possibly drop down right on top of our car. 4:39PM on May 7th, 2011 was the most amazing moment of my life as I watched a little ball of dust and soot be thrown into the air by my beautiful, silver-gray, horizontal, elephant trunk tornado. 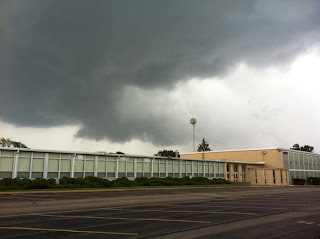 It had touched down in Rantoul, IL just SW of where two highways intersected. Soon after I called Brandi to try and get a hold of a different NWS telephone number. 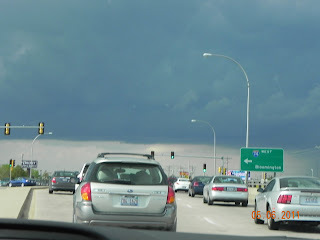 At this point the rotation and funnel (the tornado had lifted) could only be seen out of the sunroof of the minivan. I lost visual of it within the minute. I called my friends that were down the highway further south of me and tried to figure where they were. That was the scariest part of my experience. I had now lost all visual site of the funnel/tornado! As soon as the phone connected to Cara, my friend, she told me they had just entered some heavy rain and hail. WHAT A RELIEF. I could see the downdraft she was in from the rear window and saw there was enough space where they would not enter the rotation. This concludes my first (and hopefully not last) tornado. Just over 20 inches of snow was recorded on February 1st and 2nd this year. It cost a staggering $38 million (huffingtonpost.com) for Chicago to sort through its after effects. 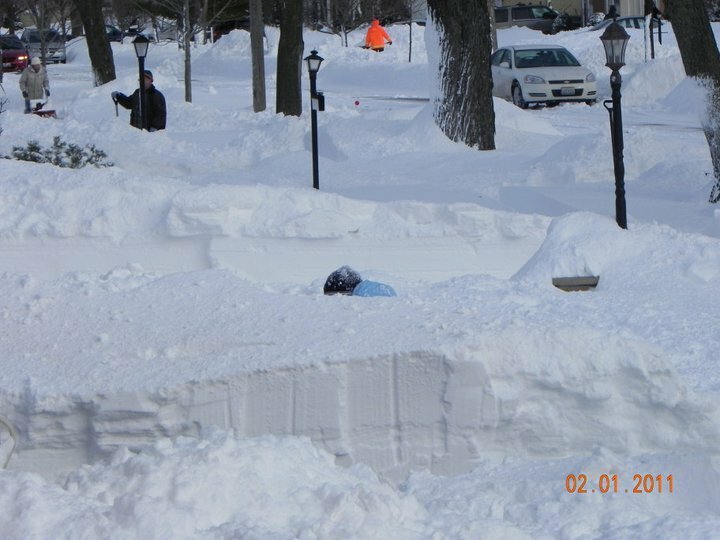 The NWS employees had already began forecasting the blizzard quite a few days in advance. They sent out the first blizzard warning hours before the first flake fell. 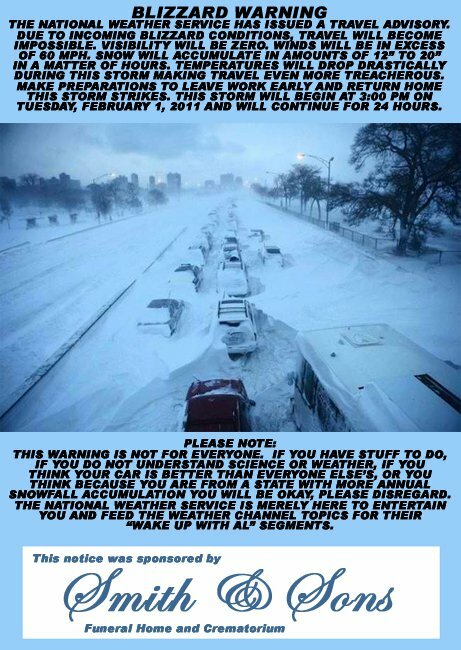 Still, people ignored them and got themselves stranded on Lake Shore Drive and their rural streets driving out to buy things they should have had prepared. This storm system brought snowdrifts seven feet tall because of winds blowing up to 60 mph, making it close to impossible to get an exact snowfall measurement. Even Jim Cantore positioned in downtown Chicago and was treated with some astonishing thundersnow and hail pellets mixed in with the snow! Thundersnow is a very rare occurrence, but I was able to see and hear five cases of it myself just that night! I remember looking at the forecast models at least four days before the epic event. They didn’t make much sense to me at the time but I was able to understand that the atmosphere had some big plans for us! My mom, of course, had her doubts. She said, “Oh, it’s not going to happen. Watch we'll just get two inches and that’s it. You know how these weather people are.” Needless to say this highly upset me and I practically printed out every possible document to convince her, but no such luck. I told her to just wait and see. After what seemed weeks of waiting, the day –February 1st, 2011- had finally arrived. School went on as usual, even though I was freaking out about the upcoming storm. As soon as school let out, I raced home and went straight to the computer to see the new models and any new updates. The storm system had already exploded to the west and south of Chicago. It seemed to be moving north and wrapping upwards into the low-pressure center. The snow began in my area at around 5/6:00 pm. It was very light and dry, but there were very strong sustained winds that dropped the visibility very low. I had TWC on, camera ready, computer set, and IPod Radars charged and good to go. 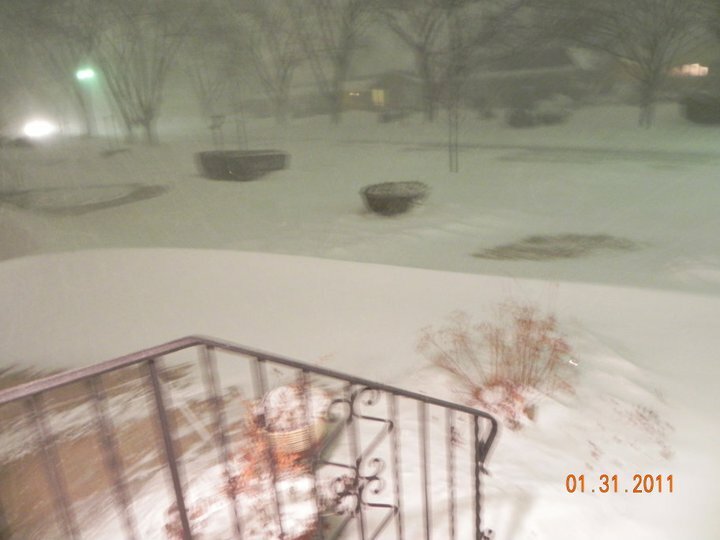 Three short hours later, the winds picked up to very strong gust, most likely 60mph, and a heavier snowfall. At one point small hail pellets started falling, and me being the weather nerd I am, ran out to greet them! 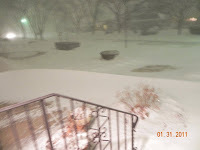 By now there was at least 5 inches of snow on the ground, with pavement showing in some places, and one foot snow drifts in others! As midnight approached, I had my first thundersnow experience. My mom headed off to bed and I stayed up to embrace this Blizzard…from inside my house and window of course! I fell asleep around 4am on Wednesday, February 2nd to the sounds of footage being replayed by TWC. I woke up again to see snow falling in clumps! There was at least 10 inches dropped from the last time I had looked. 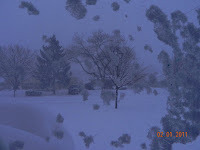 Snow was everywhere, but higher in some places due to the wind pushing it around all night. I could only see out half of my window, so I ventured outside. I could’ve jumped off the staircase into the snow, and still be a few feet off the ground! 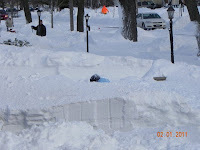 These snowdrifts were up to 8 or 9 feet in just my backyard! Unfortunately, we had to also shovel through all this mess! A good five hours later and three shovels and two snow blowers we were free! This is an event not many will forget, and all children will hope for to happen again soon! 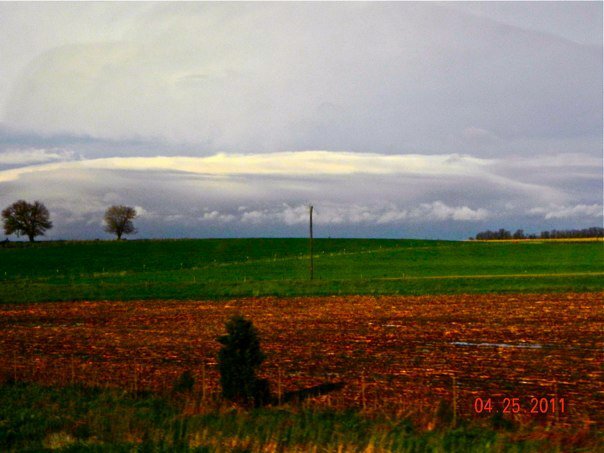 Chasercon 2011 was undoubtedly one of the best experiences of my life. The annual storm chasing convention allowed me to meet new friends, learn efficient ways of forecasting, and expand new horizons. Chasercon is a three day event located in the Red Lion Hotel in Denver, CO. This is a timeline of my Chaser con experience. 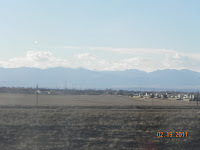 5pm- My mom and I had just completed a near 13 hour journey from airport to airport and had finally landed in Denver, CO. A shuttle bus picked us up, courtesy of the Red Lion Hotel. When we walked through the front doors of our hotel, I couldn't believe my eyes! It was a storm chaser's wonderland! We checked in and went up into our rooms to freshen up. 6pm- The first stop was the vendor booths! 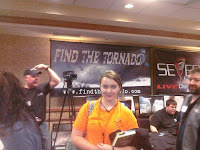 There I met Roger Hill and organizations such as Baron, weathertap.com, SKYWARN, photographers, chaserTV, Unpredictable Weather Guys, SevereStudios.com, Find the tornado.com, Tornadovideos.net, and SilverliningTours.com. I met a number of amazing people, and I started introducing myself as the "backyard Storm Chaser". 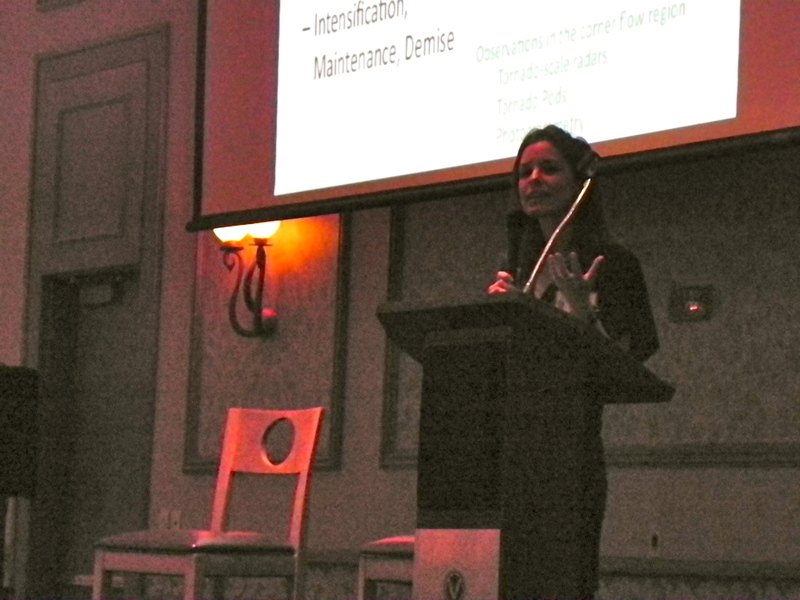 8am to 9am- Dr. Karen Kosiba was the first presenter. She talked about the amazing Goshen County Tornado of 2009. 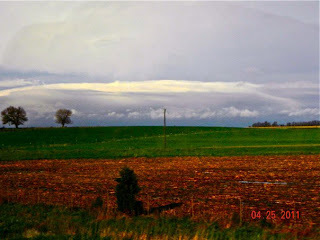 VORTEX2 (Verification of the Origins of Rotation in Tornadoes Experiment 2) was on this particular twister and was able to document its entire life cycle. 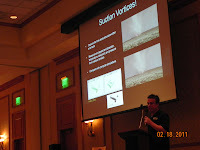 Dr. Kosiba also discussed the 2010 season of VORTEX2's adventures and intercepts. 9am to 10am- Jon Davies' presentation talked about how outflow boundaries in storms and it's effect on tornadoes. It was very informative and it cleared many questions in my head. 10:15am to 10:30am- We had a short break in which I checked on my mom, had some more coffee, and recharged my camera. During this break I also won an Accu Rite Weather Station! 10:30am to 11:30am- Mike Bettes gave a wonderful presentation on TWC's (The Weather Channel) great tornado hunt and scored the Goshen County Tornado (same as VORTEX2). He also discussed the ratings of TWC when there was a "normal" day and when disaster strikes. 11:30am to 1:30pm- There was a three hour intermission to do whatever we pleased. My mom and I headed down to the Cafe where we had lunch. I met Tiffany, Curt, Terry, and Reed there and struck up a great conversation with them. I then wandered off to the vendor booths and talked to the amazing hosts; Roger Hill and Tim Samaras some more. I have to say it was overwhelming meeting some of the best chasers in the world! 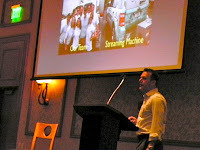 1:30pm to 2:30pm- The amazing Dr. Greg Forbes of TWC gave a enlightening presentation on the severe weather of 2010. 2:30pm to 3:30pm- Reed Timmer gave a funny and fantastic presentation on TVN's (TornadoVideos.Net) chase season. It included great media, Discovery's Stormchasers, and their research on tornadoes including graphs from the Horizontal RADAR. 3:30pm to 3:45pm- Another short break where Tiffany introduced me to Justin! 3:45 to 4:45 pm- Dr. Yvette Richardson gave a presentation on her belonging to VORTEX2. I thought it was very well put and I hope to be one of her students when I finally reach college! 4:45pm to 6:30pm- My mom and I went up to our room to recharge (both ourselves and cameras). I got ready for the Banquet dinner and quickly changed into a new outfit. I soon discovered I was way overdressed. I spent the remainder of my time talking to (and meeting) Brian P., Scott, Kevin, Colt, Isaac, Justin, Curt,Tiffany, Reed, and may others. 6:30pm to 9:00pm- My mom and I sat down and enjoyed delicious food and , of course, more coffee! 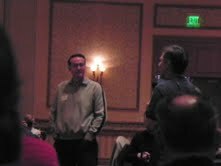 The lights slowly began to fade as we awaited the infamous Tim Marshall presentation! It lived up to my expectations and much higher! It involved many cartoons, media, puns, and jokes only storm chasers would get and yet it left everyone (including hotel staff) laughing. It was ingenious. I am counting down until next years! 9:00pm to 12:00 am- The rest of the night was dedicated to videos of fellow storm chasers.I met up with Scott again and he introduced me to Tim Marshall. We soon found a table and sat down. As I looked around my new table I saw Angie, and Justin and THE Dr. Greg Forbes was sitting across from me. As I was about to introduce myself the first video began. I couldn't find the time in between, but that is alright since I had Scott explaining to me more advanced storm structure than I knew of before. After a while we parted ways and I ran into Brian and his Grandma and we watched videos until it was time to depart to our rooms. 8:00am to 9:00am- Presentations started off with two cups of coffee. Steve Hamilton gave an informative presentation on Orographics, in which I learned quite a bit. It helped explain yet more questions I had! 9:00am to 10:00am- The vendor booths seemed like the place to go and I met Paul S. there and walked around to every booth double checking I had had my mom buy everything I wanted. 10:15am to 11:00am- Tom Magnuson, a NWS employee, setup a wonderful presentation on the collaboration between the local NWS offices and storm chasers. 11:00am to 12:00pm- Dr.Greg Forbes gave another amazing presentation on how he made the TOR:CON index and his severe weather forecasting methods. 12:00 to 1pm- Chasercon is wrapping up with only a NWS SKYWARN program to complete the day. My mom and I headed off to the Cafe for one last lunch, and we see Dr. Greg Forbes there! There I formally introduced myself, as I had done many times that weekend. He was extremely kind and seemed to take interest in our conversation. We wished each other the best of luck and went our separate ways. Justin stuck around with me for the SKYWARN program. It was a bit different than the one back at home, but none the less fun! In conclusion Chasercon let me meet so many new friends, more than discussed here, and help me see the world of chasing from the inside looking out. A chance not many people get and one I am extremely thankful for! I can't wait until next year!